Leaning to the east, this small granary in Kneehill County near Trochu, has been buffeted by strong chinook winds from the west for many years and on this day it was about to get hit again. All the dark brooding clouds were just behind the leading edge of this new chinook which warmed the air to a balmy 17ºC. The warm wind made fairly quick work of the last remaining snow and all the small creeks were running strong with meltwater for the next few days as the water, following the law of gravity, rushed on the quickest route downhill towards the Red Deer River. “Snow Eater” the Blackfoot call you. 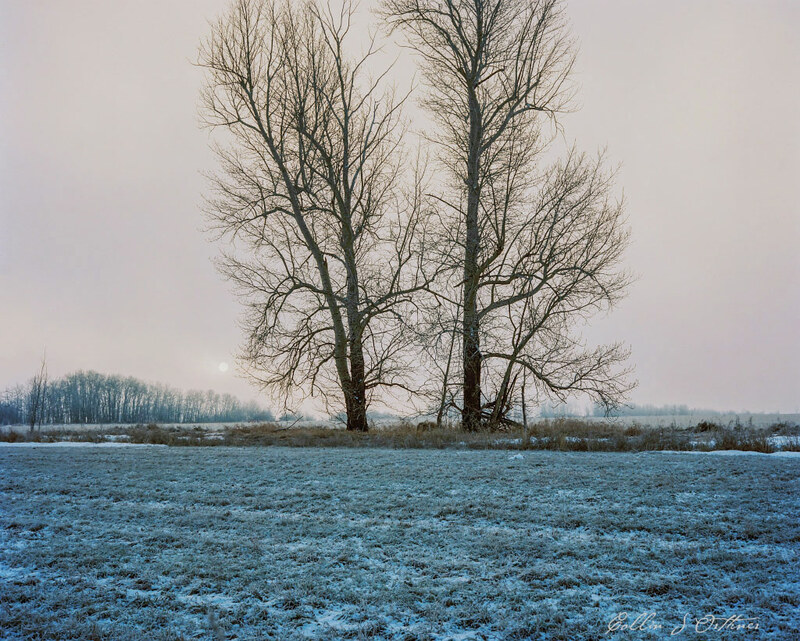 A few months back when the snow was just starting to fall I came across many many tree, big poplars, likely close to 80 years old, that had been cut and piled. Hundreds of them, to make more room for grain. The benefits of a windbreak gone. The benefits to all the birds and other wildlife that called it home, gone. the aesthetic beauty of these trees, gone. It felt like a disaster to me! What would make someone destroy such beauty for so small a gain? 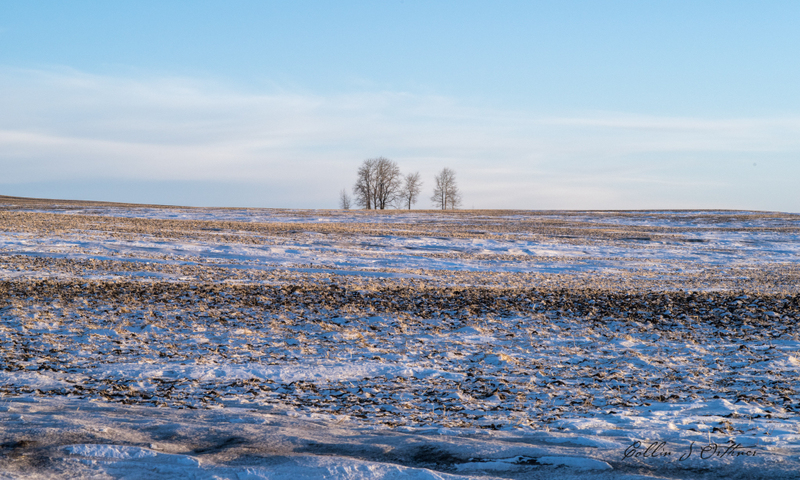 Then, in spring as I was driving around Red Deer County during one of the last few flurries to spread it’s white powder coating on the land, I came across this beautiful windrow quite near to where the others had been cut. There was a thick fog all morning allowing only small glimpses of what was around me. A cold wind blew in and started to clear off the fog as the sun was rising. I noticed it shining through the fog only momentarily numerous times and managed to line it up with these majestic trees only to have it disappear just as quickly. I raced into this field in the hopes of seeing it again. Battling the strong cold wind, I managed to get the camera all set and ready with my gloves off and could feel my fingers stinging painfully. Putting my gloves on helped for sure, but being out in the wind was very unpleasant! Thankfully the sun poked out from behind the fog long enough to capture the view on film and after getting back to my car and warming up my fingers over the heating vents, I couldn’t help wonder if this windrow might be seeing it’s last season before falling to the bulldozers that seem intent on stripping our land of the few bits of remaining beauty. Here in Red Deer today we have had some very strong winds and along with the wind came some very heavy snow squalls. They wouldn’t last more than five minutes each, but did it ever come down! I was out again today with my borrowed Pentax 645Z as I only get it until Wednesday morning, so it didn’t matter to me if it was cold and snowy out, I wanted to play with this machine. The camera is completely weatherproof, so there was no worries about it getting wet either, which makes working in these conditions so much easier. Just so long as no moisture gets on the front element you are good to go. Clicking on the image will make it a bit larger. No, it isn’t 601 Street, but it is my 601st post on this blog! I had to do inventory at work today from 8 – 4:30 and my Pentax rep dropped by to lend me his demo 645Z medium format camera. Needless to say, even though I was rather tired from the work all day, I had to go for a bit of a drive before the sun went down. So, off I went to some of my favourite areas south of Red Deer. 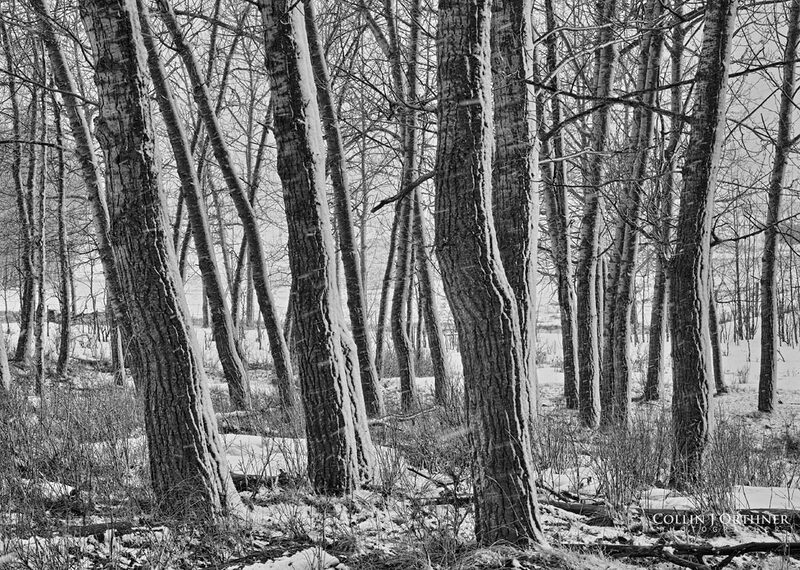 This small stand of trees will likely be torn down shortly as it is one of the last stands in the area that hasn’t been ripped out and burned. So sad, as they look beautiful and I’m pretty sure the birds enjoy them as much as I do! Cross lighting from the beautiful late day sun was really showing off all the texture of the field. 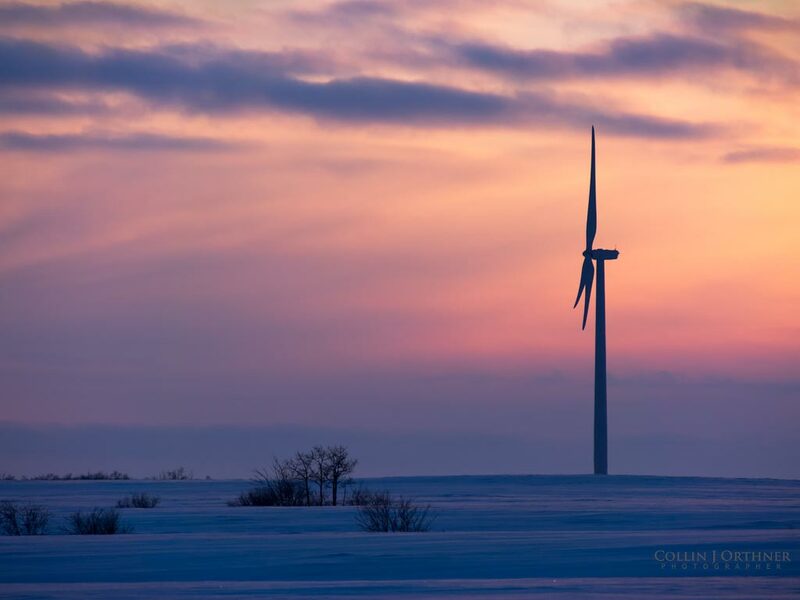 The wind was howling across this open field, so I used my extra large, heavy duty tripod to keep things still. The image really doesn’t make you feel as cold as I was!! Heading up to Morraine Lake at 2:30 am is not exactly the thing I was thinking about snuggled in my bed, especially considering my head didn’t hit the pillow until 12:30 am. But, two hours of sleep is certainly better than none and so myself and a few other photographers I was helping lead around Banff National Park in June, hit the highway. 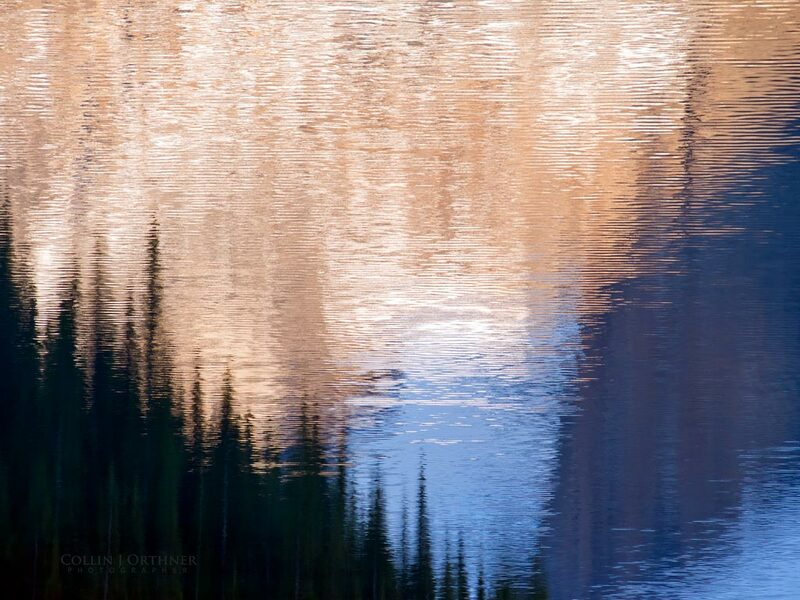 Sunrise was about 5:30 and after the nicest colour was gone I lingered a bit and instead of the iconic shot of Morraine Lake that appeared on our old $20 bills, I instead saw a beautiful abstraction presented by the reflections of the mountains in the lake. I zoomed in as close as I could and fired off many, many images as the breezes ruffled up the surface. Back in fall I spent an afternoon wandering along the shore of Gull Lake with a good friend. The wind was very intense and there was certainly no hope of a crisp image, so I let the wind do what it does best – blow. 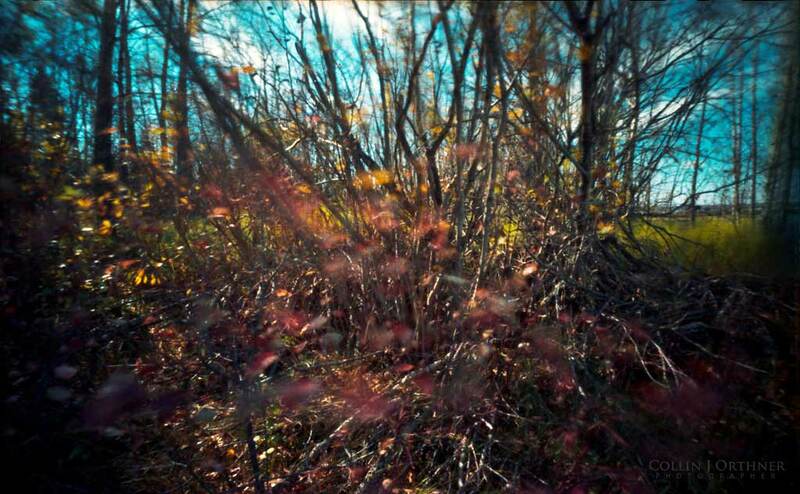 My pinhole needed about 8 seconds for a proper exposure which allowed the trees and grass to move wildly in the frame. This post is a 6 month (+ 1 day) anniversary celebration of the first snowfall of autumn 2012 (October 20th) in Edmonton. Congratulations to all in our capital city! I made this image yesterday morning here in Red Deer County. 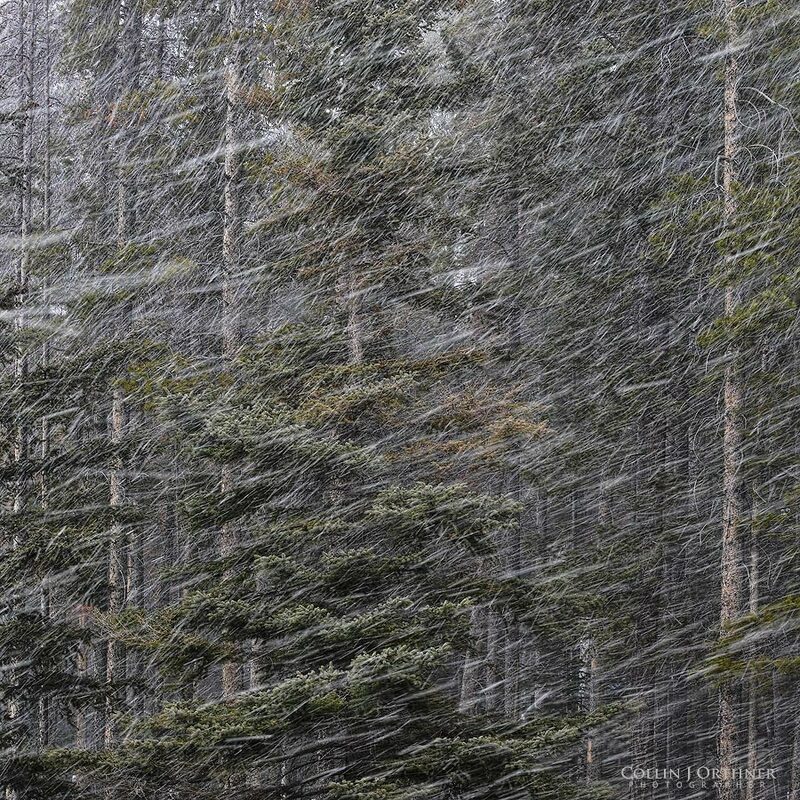 A heavy snow squall, that lasted only a minute or two, blows through the trees in Banff, Alberta. 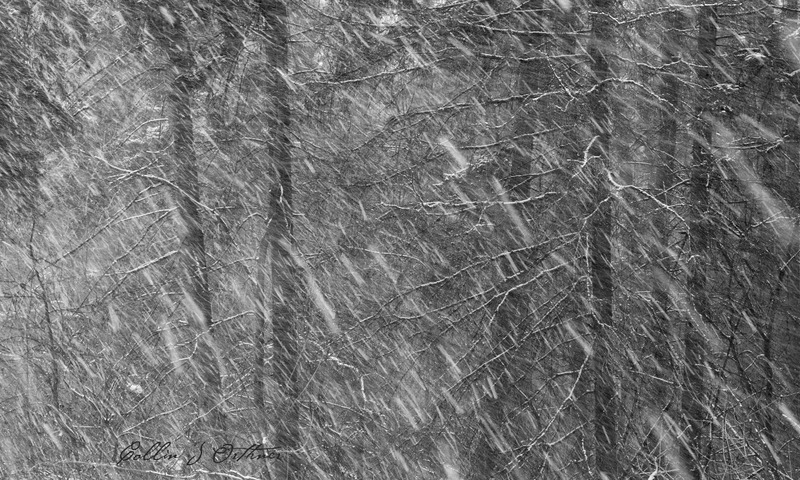 Strong gusts of wind a couple days back brought with it snow and cold as fall turns into an early winter. I really hope the snow goes away again until December 21st or so, as that’s when winter should start, not in the first half of fall! All images and text copyright (c) Collin Orthner 1998-2017. All Rights Reserved. If you are interested in using any of my images commercially or if you are interested in obtaining a print of any of my images please contact me – corthner (at) shaw (dot) ca. A passion for photography is a natural for me, when as a child growing up in the prairies and badlands of Alberta I spent days exploring nature, geology, geography, and weather. “I was, and still am, enthralled by the grandeur of a prairie thunderstorm, the welcoming song of a meadowlark or the thundering roar of a train coming down the track,” and it's that inquisitive, observant nature that continues to fuel my creative work that resides in private collections across North America and Europe. My involvement in photography, however, goes well beyond personal explorations. With experience as the staff photographer with the Royal Tyrrell Museum of Palaeontology , Reynolds- Alberta Museum and other government positions, and with work published worldwide in Travel & Leisure, Canadian Geographic, Life, Photo Life, Readers Digest Press (Australia) and Japan Times.